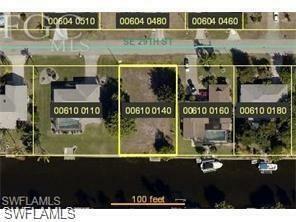 Gulf Access lot in established SE neighborhood off Del Prado Blvd where all the big shops are. Southern rear exposure. Seawall and concrete dock in place. 1 bridge to go under, quick access to river and Gulf. All assessments paid. Build your dream home right here. Listing courtesy of Koen Roelens of Roelens Realty & Property Mana.